Mile 16 took us around Willen Lake and it was a completely different experience after running through this area last year in the pouring rain! The sun was shining, kids were out everywhere and I wondered if any marathon runners had stopped at the pub or for an icecream?! I saw Ian, one of our club runners, pint in hand cheering us all on and it kept me going strong, running through the midst of all those people. MK had done a terrific job at separating the pedestrians from the runners and the support here was superb! It really kept me going seeing Ian, and then a little further along, Kerry, somebody who had joined the beginners group with me back in 2011 but now no longer runs anymore. Then I saw Dan. In the morning I had asked Dan if he would video a section of me running out on the course for my Mum. She had desperately wanted to see me run my first marathon last year but isn’t a very confident driver and when trees had toppled down everywhere the morning of the race last year and she couldn’t sleep the night before due to the wind hitting 26 mph she rang me extremely upset the morning of the race to say that she was too terrified to make the trip down to see me but was determined to watch my second marathon. Unfortunately, Mum’s chemo hasn’t gone as planned recently and she had missed the last three sessions due to her white blood cell count being too low. Her immune system is extremely poor right now and she has very little energy so was unable to make it for marathon number two as well. I decided over the weekend that I would put together a little video for her to show her some of the day and recorded a little piece in the car on the journey down. Dan then ran alongside me filming me just after mile 16 and I am yet to record my finish reflections to add to the video. If it all turns out how I would like it to, I shall post a copy on the blog towards the end of the week after I have given a copy to Mum. Dan commented on how much stronger I looked at this point. I had been incredibly low when I saw him at halfway. I came past him running and he picked up the pace next to me, running alongside for several minutes. In the picture below which the official photographer caught, you can just see Dan with his phone out to the right of shot! After Dan left I knew I would struggle. 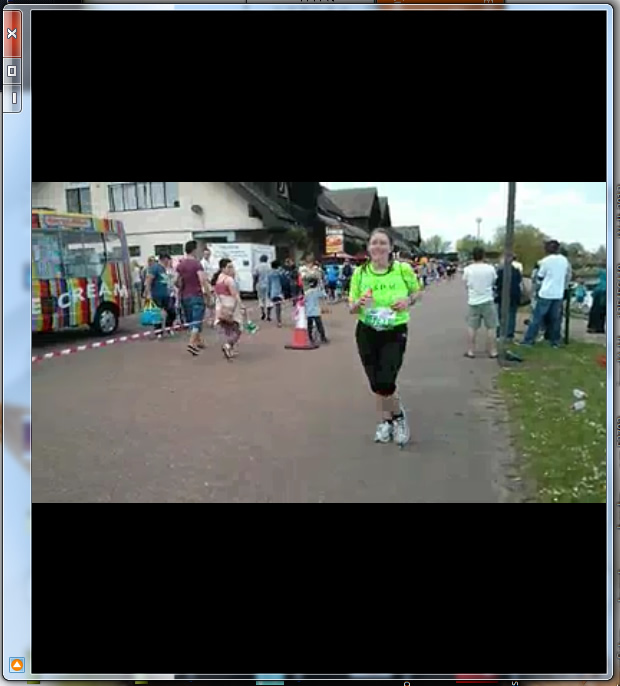 It was still 10 miles until the finish! My chest started to ache. Right in the middle of my chest, at the bottom of my rib cage. I ignored the ache to begin with although my walking stints were getting much longer and more frequent by now. At mile 18 I was ill. I hadn’t been the only one. From this point onwards, I dodged several piles of sick across the track. 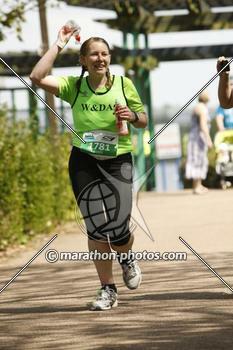 Luckily I wasn’t too far past the water stop so I headed back to get a refill in my bottle before continuing. From about mile 20 my chest HURT, really HURT every time I tried to run. I felt like I couldn’t take a full breath in and trying to do so hurt immensely. I was pretty worried as to what was wrong. The ache in my legs I could deal with and put out of my mind, but this pain felt like something was really wrong. I ran when I could bear the pain but it was never for too long any more and eventually I ended up falling into a rhythm of 0.2 miles jog and 0.1 miles walk. It was a real struggle to get further than 0.2 jogging without being in pain but I wish I had put this backup plan into place much earlier on as I probably would have been able to maintain it until the end. Mile 24 came the last ‘drinks stop’. I saw the sign, swigged the last of my water and held my hand out for another bottle. Except, it was a Gatorade station, with no more water stations to go! I’d not drunk Gatorade before and I can’t stand blackcurrant squash so wasn’t hopeful of the taste, but I needed more fluids so grabbed one anyway. It was too sweet for me and I chucked it a little while later but it did get me that little bit further. Two kids with water guns were just before mile 25 and then a boy of not more than 6 ran to the bottom of a hump-back-bridge, extending his hand and said that if I was struggling he would help pull me to the top! The cutest thing ever! Of course I took his hand! I knew I needed a strategy to get into the finish and decided that I would run from 25.2 miles out and push through the pain to the finish, no matter how slow. I began quite slowly. As I ran along the road we had headed out on hours earlier Kev came rushing over to the edge of the railings to high five me on my way in. I forgot completely about the pain in my chest and this pushed me on to pick up the pace and power past several people. I realised I still had quite a way to the finish and didn’t want to push too hard, but when I heard our male club captain shouting my name across the car park as I turned into the stadium I threw up my left arm and picked up the pace further. The best feeling was as I entered the stadium and all of the Welly runners were sat just right of the entrance and began screaming my name! I managed to pick up my pace just one more notch to finish with the quickest pace of my marathon, overtaking more than 10 people in the stadium alone and then threw my arms up like I wish I’d done in my first marathon pictures! Awful, but I had finished it. Many people hadn’t. 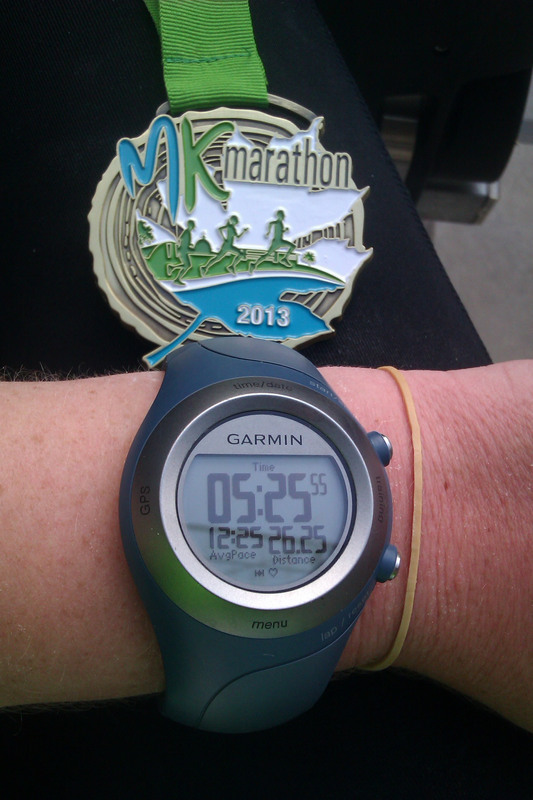 I was happy that I had made it to the end and still achieved my ‘marathon #2′ title however bad my time. Race official stats: 2045 completed the race, 494 DNF. 1811/2045 was my overall position. 405/509 female finisher. 226 of 288 senior female finisher. Finish time: 5h 25m 52s. A PW. But the medal was pretty nice! 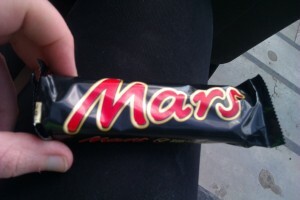 In the goody bag we got a Mars bar, a banana and a race t-shirt. 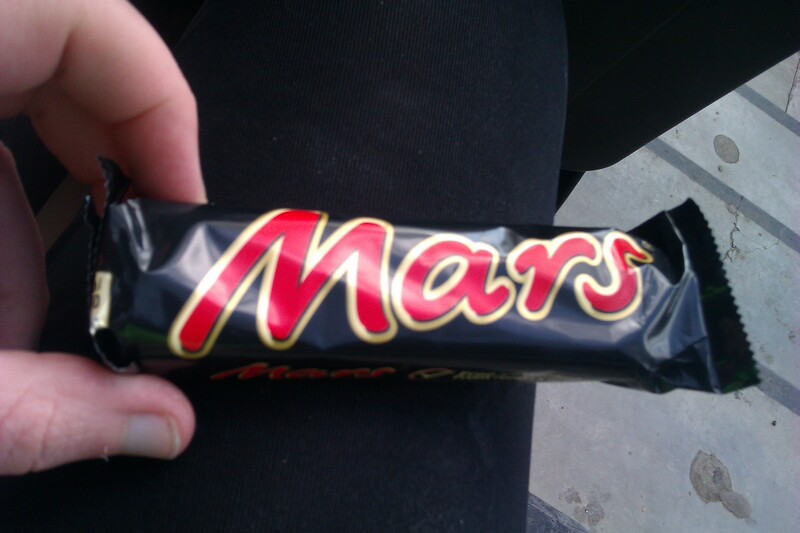 I picked at the mars bar when I joined my club mates but didn’t really feel hungry at all which was odd. Last year the first thing I wanted as soon as I got over the line was food. This year I had my Mars bar then when Dan announced he was starving on the way home I had a fruit bag and a smoothie when he stopped to get food but had to really force them down. My appetite was not around! There was still one more club member out there after I came in so we waited until nearly 6h 30m for him to come through the finish before club members dispersed and headed home for more relaxing evenings. Whilst waiting for Andy to come through the finish, I learnt that four of our club had dropped out. Two I had passed, so was aware of already. One of our club runners who achieves a 3h 30m marathon at the end of an ironman had come in closer to 4h 30m and collapsed over the finish line! Lots of our runners were 30mins + over their normal marathon times due to the heat. The amount of support and friendly banter I had with my clubmates in the stands made me remember just why I love running and my club so much. I will not let them down and I will be running another marathon this year and setting myself a new PB!!! 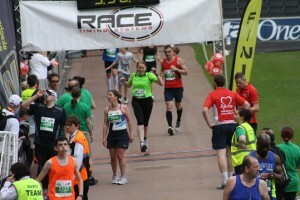 I think the guy in orange’s face in your finish line photo says it all. You did the right thing – pushing too far and collapsing before you can finish earns no medals. It’s just terrible luck the conditions you have to face in the MK Marathon (I read your recap from last year too) but all we can do is the best we can under the circumstances. It’s a cracking medal by the way – very impressive! I’d imagine the heat threw off your appetite if you’re anything like me. I can *always* eat but after the Edinburgh Marathon I couldn’t face anything for hours too. Depending on your recovery you could always use MK as a long training run for another marathon? Or your Ultra as a LONG long training run 😉 It depends how long you like to leave between them, which is obviously an individual thing. Be proud of yourself anyway – you ‘beat’ 494 people…I think that’s one of the highest DNFs I’ve seen proportionate to the number of entries. I hadn’t even noticed the guy in orange until you pointed that out! He looks mega puffed out! Glad I earnt my medal. I love the way it looks! I have been on the hunt for another marathon for soonish but I don’t think there are any that are suitable off the back of the ultra out in my side of the country. I am thinking Mablethorpe in October though for my next one and of course MK take 3 for next year! Fingers crossed there’s no snow blizzard or something equally as crazy for that one! Congrats on the finish! It can be so hard to run in heat when you’re not used to it, so it sounds like you did the right thing in slowing down so you could finish. I’m not too surprised that you didn’t want to eat afterwards! After my first marathon, which was in pretty warm weather, I felt super nauseous and didn’t eat anything solid until several hours later. Steph recently posted…What to do post marathon? Thank-you! And that was exactly how I felt too. I picked at the apple slices and grapes and dipped them into my smoothie because it took longer to get through them and I really didn’t fancy eating! I knew I had to eat though, so forced them down! Congrats on finishing!! This sounded like a tough run for a lot of people!! I love that you made a video for your mom! Thanks! It was crazy tough and I was very glad when I had finished and could sit down and spectate with the rest of the club! Making the video for my Mum came as an idea to me at the last minute the night before but I’m really glad I did it. She loved it! Well done for finishing, and as Jess said you were right to take it easy (relatively speaking) and not push yourself too hard. Also, your time was only about 5 mins behind my first (and only) marathon time and I did run every step (clearly very slow running! )- maybe it was not the time you wanted but it was still a finish and you should be proud as doing it in that heat is super tough. I love the point about the fact that runners are so encouraging and such a super community. Massive well done to you for running every step of the way! No matter how slow the run was, that is a massive achievement, that many ‘faster’ runners cannot say they have achieved! That was something that I was hoping for at MK, having run a 20 miler non-stop not long ago and a 22 miler with minimal stops (tying shoes, filling water, etc) but on the day it was not to be! I LOVE the fact that the running world is so supportive. Everybody has their own goals to work towards and it is fantastic to see somebody else achieve those goals that they set out to achieve. Finding my running club was literally the very best thing I have done!